Interested in Becoming Catholic or Knowing More about the Catholic Faith? 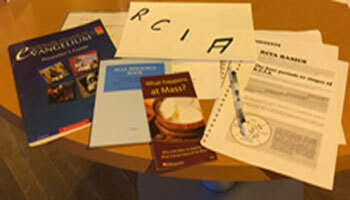 RCIA stands for Rite of Christian Initiation of Adults. For those adults who wish to become a Catholic, the parish invites you to join with a group of Catholics who will explain the faith to you and help you on your journey to a deeper faith. Adults who wish to become Catholics are Baptised at the Easter Vigil, the principal service in the Catholic Year that celebrates the Resurrection of Christ and our Baptism. If you have already been baptised there is no need to be Baptised again and there is a simpler service which also takes place at the Easter Vigil. Generally the time of preparation takes a matter of months, but the time is flexible and depending on the conversation you have with the RCIA team, the period of preparation can be extended.